Phil is now a Mechanical Engineer graduate. 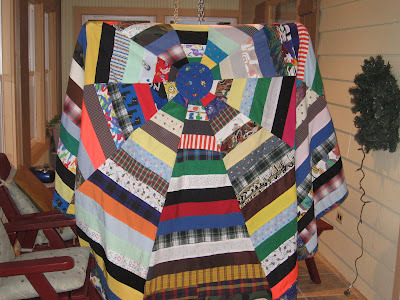 In celebration of this wonderful event I let my creative juices flow and put together a 10 sided quilt as part of our gift to our most beloved son. Yes, each one of the wedges is 36°. It is something he has been asking for since Middle School and it took until this year to figure out the details of the construction. The fabric is from things I made for him over the years. Most was from his preschool years. Surprisingly, some was very recent. There were some saved fabrics I don't remember using. Oh, the memories of the last 24+ years. 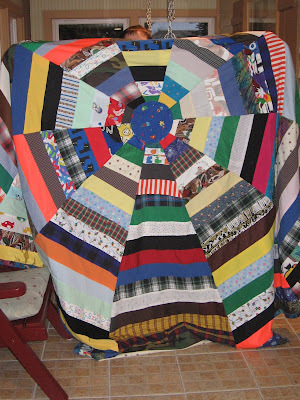 The quilt measures 120" from side to side and fully covers his bed. It is backed with a dinosaur themed fleece. 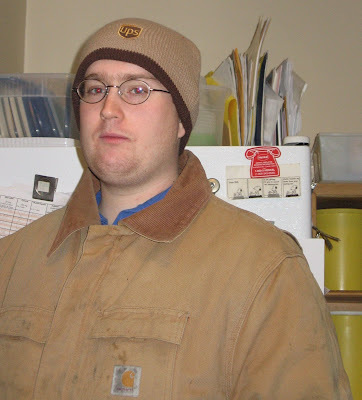 Take a double click on the pics and see if you remember Phil in any of the fabrics when he was 36" tall. The person holding the quilt is Larry.